We aim to realize "human-like robots" that operate in human daily environments in symbiotic way and collaborate with people. For this aim, we conduct there are three types of research works, as follows. Drazen Brscic, Takayuki Kanda, Tetsushi Ikeda, Takahiro Miyashita,“Person tracking in large public spaces using 3D range sensors”, IEEE Transactions on Human-Machine Systems, Vol.43, Issue 6, pp.522-534, 2014. 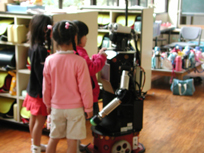 Takayuki Kanda, Masahiro Shiomi, Zenta Miyashita, Hiroshi Ishiguro, and Norihiro Hagita, A communication robot in a shopping mall, IEEE Transactions on Robotics, 26(5), pp. 897-913, 2010. Takayuki Kanda, Dylan F. Glas, Masahiro Shiomi, Norihiro Hagita, Abstracting People's Trajectories for Social Robots to Proactively Approach Customers, IEEE Transactions on Robotics, 25(6), pp. 1382-1396, 2009. Takayuki Kanda, Hiroshi Ishiguro, Michita Imai, Tetsuo Ono, Development and Evaluation of Interactive Humanoid Robots, Proceedings of the IEEE (Special issue on Human Interactive Robot for Psychological Enrichment), Vol.92, No.11, pp. 1839-1850, 2004. Takayuki Kanda, Takayuki Hirano, Daniel Eaton, Hiroshi Ishiguro, Interactive Robots as Social Partners and Peer Tutors for Children: A Field Trial, Human Computer Interaction (Special issues on human-robot interaction), Vol. 19, No. 1-2, pp. 61-84, 2004.